Dog flu, also known as canine influenza, is again making headlines for the toll it’s taking on the health of dogs from coast to coast. Here’s what you need to know about this highly contagious illness. 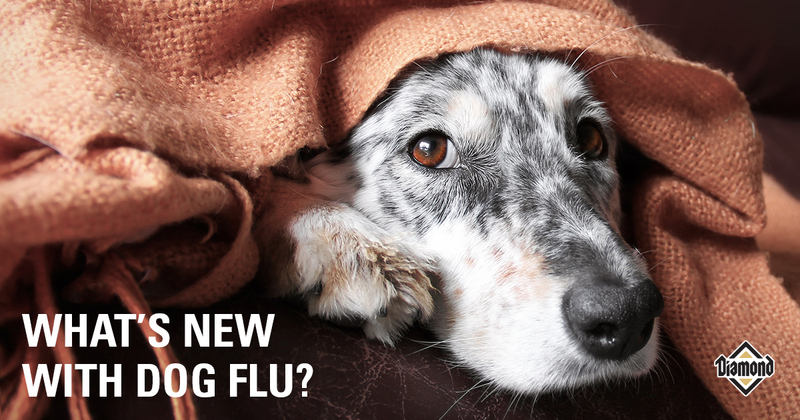 According to veterinary experts with Merck Animal Health, dog flu can affect practically any dog. However, “social” dogs are at greater risk of exposure to the viruses that cause dog flu, canine influenza virus (CIV) H3N8 and H3N2. If your dog participates in any of these activities, you have a social dog who is at greater risk for dog flu. CIV was first reported among racing greyhounds in Florida during 2003. A second, different virus emerged in 2015 among dogs in Chicago. Since then, dogs in nearly every state have tested positive for one or the other virus, and both CIV strains have been confirmed in most states. Since March 2015, more than 3,600 dogs have had positive CIV test results. Currently, there are outbreaks in Michigan, New York, New Jersey, Massachusetts and Wisconsin, so the number of positive CIV tests is expected to climb higher. It’s important to note that these results are from tests performed by the 12 veterinary diagnostic labs that make up the CIV Surveillance Network and don’t capture all testing performed nationwide. In addition, veterinarians are only required to report canine influenza in some states, such as Maine, Massachusetts, Michigan and Minnesota. It’s voluntarily reportable in Oregon, but the majority of states do not require veterinarians to report dog flu cases. According to the American Veterinary Medical Association (AVMA), CIV may survive in the environment for about two days, on hands for 12 hours and on clothing for up to 24 hours. Because dog flu is a relatively new illness, most dogs exposed to either CIV strain become infected, with about 80 percent of dogs developing disease-related signs. The majority of flu cases are mild, but up to 20 percent of CIV-infected dogs can develop a moderate to severe form. Some dogs may have a fever, and in more severe cases, high fever and pneumonia may develop. If these signs sound familiar, they should. Many of these clinical signs also occur with other canine respiratory diseases such as kennel cough. Since lab tests are available to identify various respiratory disease-causing bacteria and viruses, including CIV strains, you’ll want to have your veterinarian perform the appropriate test if possible. Wait and see? Or proactively protect? Most dogs recover from dog flu within two to three weeks. However, many veterinary specialists recommend allowing at least four weeks for a dog with a respiratory infection to recover fully. This can also help reduce the risk of spreading CIV to other dogs. As with other viral diseases, treatment for dog flu is primarily supportive. However, if pneumonia or a secondary bacterial infection develops, additional diagnostics and treatments, such as X-rays, antibiotics or fever-reducing medications, may be needed. As the owner of a social dog, you also have the option of protecting your canine companion. Dog diseases caused by viruses are best “treated” through prevention with an effective vaccine. Veterinarians now have several dog flu vaccine options and can protect your social dog against both CIV strains with two doses of a vaccine. Your veterinarian is your best resource regarding your dog’s health. Be sure to talk with your veterinarian about your dog’s risk for various diseases — including dog flu — and what you can do to protect your furry best friend.